Many emission factors are available in literature for various industries and processes. This part of Envmodels site contains emission factors calculation tools to be used to evaluate fugitive emissions on industrial sites (progressive leaks from equipments). 4) Specific correlation factors application. Depending on the approach, many data collection and analysis may be required as shown on this figure. 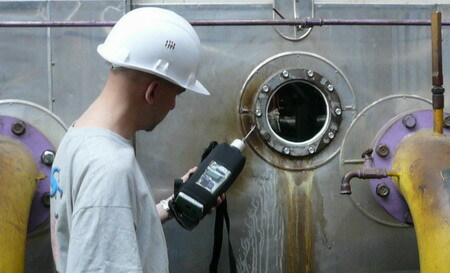 In many cases leak measurements are necessary on equipments in order to evaluate real leakage rate. The picture below presents an example of such investigation. Envmodels website proposes fugitive emissions calculation tools for the three first approaches, the last one (specific correlation factors application) has to be developed in specific for each industrial site. The analyser used to measure VOC concentration leaks must respect criteria as defined in EPA Method 21 available here. EPA-453/R-95-017. November 1995. Protocol for Equipment Leak Emission Estimates. U.S. Environmental Protection Agency.